OLD TOOLS: STANLEY NO. 129 WOOD BOTTOM FORE PLANE, SARGENT WOOD BOTTOM JACK PLANE, ASHEM CRAFT ROUNDING PLANES, STANLEY 35 SMOOTHING PLANE RIDER No. 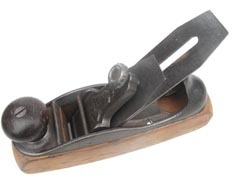 5 JACK PLANE, ,FULLERS CALCULATOR BY STANLEY, LIE NIELSEN JACK PLANE. 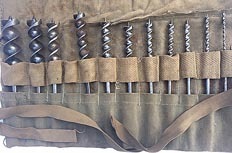 OLD TOOLS: STANLEY NO. 129 WOOD BOTTOM FORE PLANE, SARGENT WOOD BOTTOM JACK PLANE, ASHEM CRAFT ROUNDING PLANES, STANLEY 35 SMOOTHING PLANE, RIDER No. 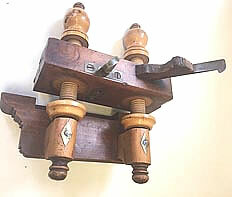 5 JACK PLANE, ,FULLERS CALCULATOR BY STANLEY, LIE NIELSEN JACK PLANE. 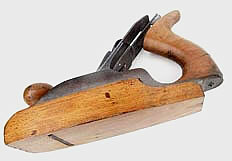 FORE PLANE 20" (510 mm) LONG. 2.3/8" SWEETHART BLADE. C. 1925. SMALL CHIP OFF TOP OF HANDLE. SARGENT No. 3415 WOOD BOTTOM JACK PLANE. 15" (380 mm) LONG. 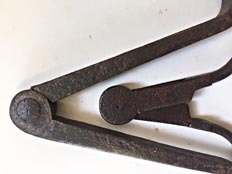 2" (NEWHAVEN, CT. U.S.A. CUTTER). NEW SOLE. PRE 1940'S. 19 mm TO 24 mm & 16 mm TO 21 mm . BOTH IN GOOD WORKING CONDITON. REPLACED STANLEY BLADE. CRACK IN HANDLE. STANLEY LIBERTY BELL No. 122 WOOD BOTTOM SMOOTH PLANE. 8" (220 mm) LONG. 1.3/4" (42 mm) ORIGINAL 1920'S BLADE. A BAKELITE CALCULATOR IN ORIGINAL MAHOGANY FITTED BOX. VERY GOOD CONDITION BUT LACKS THE STAND FITTING. LITTLE USED. IN MAKER'S BOX. 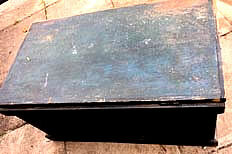 THIS EXAMPLE HAS HAD LITTLE USE BUT THERE ARE 6 SCRATCHES ON BOTTOM AND DISCOLOURISATION. ONE SIDE HAS REMNANTS OF CORROSION. NONE OF THIS AFFECTS ITS USE. STANLEY No. 28 WOOD BOTTOM 16" FORE PLANE. LITTLE IF ANY USE. ALL ORIGINAL PARTS AND FINISH. 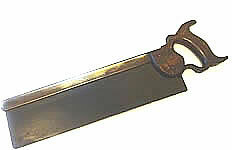 BLADE MARKED 'STANLEY' OVER RULE & LEVEL Co.
CIRCA 1895. RARE TO FIND AN EXAMPLE IN SUCH GOOD CONDITION.